Netflix reported mixed earnings last night (Monday) along with low guidance figures, and now the Netflix stock price is down 11.51% to $95.11 this morning. But today's drop for the Netflix stock price should not be a major concern for investors. You see, Netflix Inc. (Nasdaq: NFLX) stock is always volatile after earnings, and this is just a short-term issue. In fact, NFLX stock is still one of our favorite long-term investments. Netflix reported earnings per share (EPS) of $0.06, beating Capital IQ consensus forecasts of $0.03. Revenue rose 24.5% year over year (YOY) to $1.96 billion. That was just shy of the $1.97 billion Capital IQ had projected. S. revenue rose 18% YOY, reflecting a 14% growth in average paid memberships. Netflix added 6.7 million subscribers in Q1, taking its worldwide total subscriber count to 81.5 million. Established market growth around the world continued to increase. Netflix added 130 more countries in Q1. By expanding broadly at once, the company said it is learning how to best please consumers across a vast variety of cultures and markets. The company is sharpening its focus on delivering better video at lower bandwidth and improving viewing on mobile devices. The company expects to add 500,000 customers in the United States in Q2. That's short of the 586,000 analysts projected. 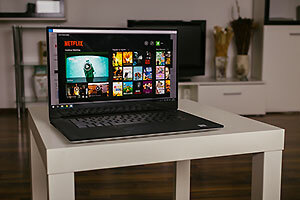 NFLX's forecast includes a "modest impact" from a price increase Netflix is implementing in May for its monthly movie and TV subscription service. Netflix expects to add about 2 million subscribers in markets outside the United States in Q2. Analysts' expectations were for 3.5 million. The company continues to spend heavily on content. Netflix raised its expected spending total from about $5 billion this year to over $6 billion next year as it works to develop the next big hit. Netflix issued downside guidance for Q1 2016. It sees EPS of $0.02, versus Capital IQ's consensus estimate of $0.05. The Netflix stock price after earnings is always volatile. That's exactly what is happening today. A number of firms lowered their price targets on Netflix following the results, which is drawing a lot of attention today. But these firms still reiterated their "Buy" ratings. Take Needham, for example. The firm trimmed its price target to $115 from $125 following "generally positive" Q1 results. Topeka Capital adjusted its price target to $139 from $142. And Pivotal Research tweaked its price target to $145 from $155 on "strong" Q1 results but weak Q2 guidance. While many will focus on the trimmed estimates, those targets still mean the Netflix stock price would climb 20%, 45%, and 52% from today's low. So there is still huge upside for Netflix shares. Money Morning Defense & Tech Specialist Michael A. Robinson said Netflix is still in an Amazon.com Inc. (Nasdaq: AMZN) style growth cycle. He calls it the Bezos model. The company builds, and builds, and builds, with profits following. While Netflix is no longer a young company, it's still undergoing a growth spurt that will take some time to fully mature. That's why we like Netflix long term. Netflix is already a preeminent provider of global entertainment. It continues to increase its worldwide presence and is determined to create blockbuster original content. Over the next five years, 35 analysts from Thomson First Call expect NFLX to boost earnings by 28.2%. That compares to an industry estimate of 15%. Despite today's decline, the Netflix stock price is up 214.65% over the past three years, making it one of the best S&P 500 performers.